Introduce your students to Bangladesh with this printable handout of two worksheets (plus answer key). Your students will read a brief overview of Bangladesh (location, capital, flag, language), write 'Dhaka' next to the star on the map to show the location of the capital, color the small map and flag, and use the map and compass to answer 6 questions on page 2. Colored pencils or crayons and a pen or pencil are needed for this activity. No other prep needed. 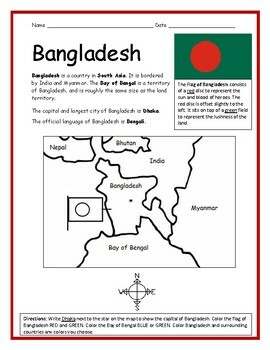 For use with Interactive Notebooks: After the handout is completed, students will cut out the map and flag of Bangladesh and paste into the notebook under the topic of Asia / Sub-topic: Bangladesh. Under the map and flag, students will write a summary in their own words of what they now know about Bangladesh. Collect handouts for other countries of Asia to add to the notebook. Click on the link to each country to view: China, India, Iran, Iraq, Japan, North Korea, South Korea, Russia, Turkey. More to come soon! Please Follow Me for more Geography worksheets. Thank you for using my Geography worksheets in your classroom! Reviews are welcome and very much appreciated.